My wife invented this one to get my oldest away from chicken nuggets. It turns out we like it too. It’s sweet and just a little bit spicy. 1. 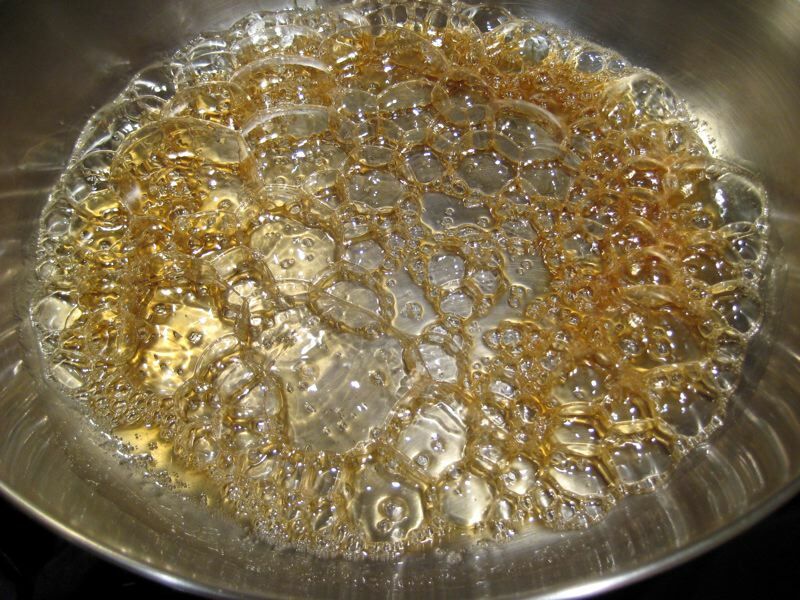 Heat honey in large frying pan on medium heat about four minutes or until it turns a carmel brown. See this image. 2. Add ginger, garlic and salt and mix. 3. Add chicken and mix. 4. 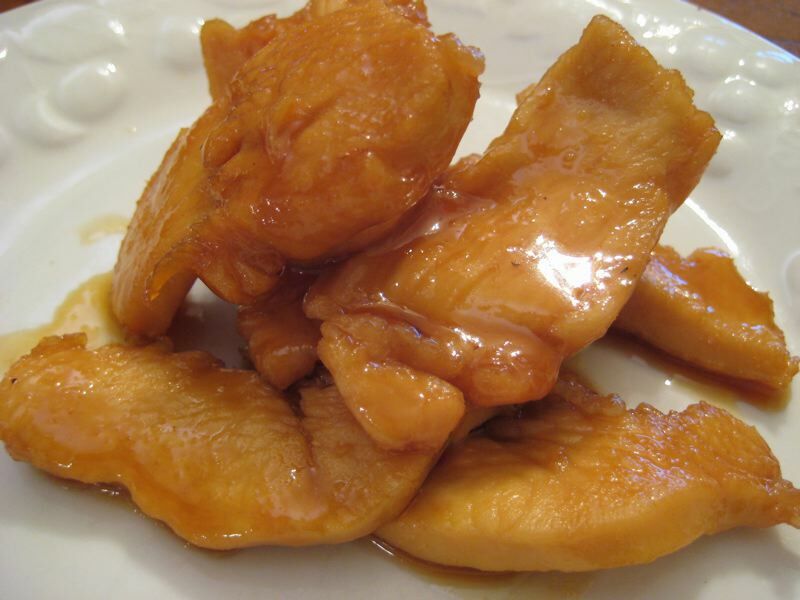 Cook for 10-15 minutes or until chicken if fully cooked, stirring occasionally. Kick up the flavor a bit more by adding 1/2 tsp red pepper flakes. Like orange chicken even better? Add the zest of one orange in the last minute or so. Be sure to get just the orange off the orange as the white part underneath is very bitter. This dish demands your close attention. You need to do the preparation before you start heating the honey as you won’t have time once that begins. Honey can go from fine to burned in a few seconds. Once the chicken is mixed into the pan however, you can breath easier. You can get a nasty burn from hot honey as it sticks instead of just running off like water. Be careful! I made this for dinner last night, served with broccoli and watermelon for dessert. My non-SCD hubby and kids had theirs with rice. This dish was a big hit with everyone. Thanks for the recipe! Yes, leaving out the ginger and using garlic and chipotle would work fine. -citrus zest (orange, lemon, lime, grapefruit) I’d start with a whole fruit’s zest, adding them at the end. – smoked paprika – not sure on amount. Start with 1/8 tsp, taste and add as you see fit. – pureed garlic will give you a strong, unique heat – see this video. Start with just one clove. – ground corriander – a fresh fruity, citrusy flavor – start with 1/2 tsp. – cinnamon – a little is sweet, a lot is hot. Start with 1/8 tsp. – savory pepper mix – see my recipe or find something similar at the grocery. Thanks for the feedback. It’s great to hear and my wife was pleased. i made this tonight. i love it! thanks for the recipe! Can’t wait to try out the other recipes! I’m glad you like it. Pineapple sounds like a good idea. I made this tonight! Tasted delicious! Only mistake I made was using thighs as they are kind of fatty. Will def make again. Thanks for the recipe and this site! You’re welcome Alisha! I’m glad you enjoyed it and thanks for leaving a comment.